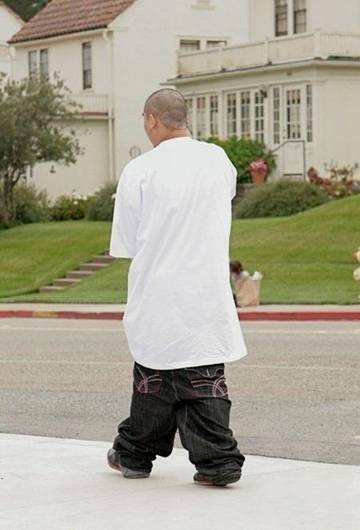 Well, this isn’t news, but as recently as December 17 of this past year (2010) the ban on sagging pants in Selma, AL became effective as a result of the 5-2 vote. Pants are considered saggy when they fall more than three inches below the hips. Of course, as with anything, the vote didn’t go smoothly. Councilman Samuel Randolph says the new ordinance “is close to racial profiling” because it is geared to minority kids. If a juvenile is caught with his pants down, so to speak, the parent or guardian will be fined between $25 and $100 and a judge-ordered stint of 20 hours of community service could be ordered. Adults in violation could pay a fine of up to $200 and a possible 40 hours of community service. I bring this up because I was thinking about this very thing since we were in Philadelphia over the weekend. Well, it really hasn’t consumed my every waking minute, but you know what I mean. We were on our way to breakfast at IHOP across from the hotel on Sunday morning and hardly a soul was out, quite unlike the day before during all the parade hoopla. But there was one young man walking ahead of us, with his entire back end, thankfully shrouded in dark blue Fruit of the Looms (I’m assuming. They could have been BVD’s for all I know, my contacts were dirty and my vision a little fuzzy). Ordinarily, it’s loose fitting boxers that are worn and they bunch up over the jeans’ low waist band. But these were form fitting and the entire full moon was hanging out. Okay, fine. Whatever. Frankly, I don’t know how anyone can walk dressed like that, but to each his own. I always wondered how those pants stay up in the first place. Well, I found this item that might be a solution to keep saggers’ pants from falling. They’re called Subs and they adjust, I guess to the degree of sag you’re looking for.